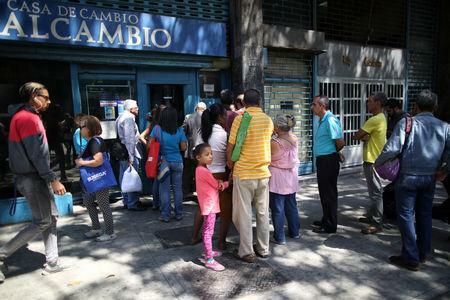 CARACAS (Reuters) - It is an unusual sight for Caracas: lines are forming outside currency exchange houses that had been largely deserted since the Venezuelan government introduced controls 16 years ago. Most European and Western Hemisphere nations have recognised opposition leader Juan Guaido as Venezuela's legitimate leader and denounced Maduro as a dictator. Maduro, in turn, says he is victim of an "economic war" and a U.S-backed coup attempt.